Home › Home and Kitchen › Lebefe 24K Gold Deluxe Reusable K-Cup Filter K-Carafe Filter For Keurig 1.0 A..
Lebefe 24K Gold Deluxe Reusable K-Cup Filter K-Carafe Filter For Keurig 1.0 A..
24K GOLD ETCHED NON-REACTIVE PURE FLOW REUSABLE FILTER is durable,no harmful chemicals and no unpleasant steel flavors, it's for a high level filtration and keeps the original flavor of your coffee. POLY FLOW lid design makes a virtually sediment-free brew and ensure the coffee drip grind is brewed evenly for a better taste. ECO-FRIENDLY DESIGN- Reduce waste of plastic and paper pods. Economical and money saver. HIGH QUALITY MATERIAL - BPA & DEHP free, no harmful chemicals, safe to use. Self-latching lid seals nicely and its mechanical hinge to ensure the durablity. Removable lid is easy to clean and dishwasher safe. ALL-IN-ONE COMBO offered in 2-packs with Bonus cleaning brush. K-Cup is for coffee drinkers who want a single cup. K-Carafe is for coffee drinkers who likes a large carafe of coffee or want to brew multiple cups at once. Cleaning brush is easy for you to clean up the filter after brewing coffee. WARRANTY: Satisfaction Guaranteed, you'll love this 24K Gold Deluxe Reusable K-Cup and K-Carafe Filter Combo for Keurig brewer or you'll get your money back! GOOD COMPATIBILITY - Lebefe TM 24K GOLD Reusable K-Cup (Single-Cup) is compatible with Keurig 2.0 (K200, K250, K300, K350, K400, K450, K500, K550, K560)and Keurig 1.0 brewer(B10/B30,B31/K10,B40/K45,B44,B50,B60/K65,B66,B70/K75,B77, B79,B100,B130,B135,B140,B145 / K145,B150,B200,B1250 / B1255. LEBEFE TM 24K GOLD Reusable K-Carafe (Multi-Cup) is compatible with Keurig 2.0 brewerK200, K250, K300, K350, K400, K450, K500, K550, K560). Lebefe 24K Gold Deluxe Reusable K-Cup and K-Carafe Filters are perfectcapsules for coffee drinkers.They're great options for using with eitherKeuring 1.0 or 2.0 coffee brewers,and you can use your Keurig brewer withoutpaying the premium price for K-Cups. Why choose our 24K Gold Deluxe Reusable K-Cup and K-Carafe Filter for Keurig? The etched non-reactive 24K gold filter mesh is food grade material, there isno harmful chemicals and no unpleasant steel flavors, keeping the originalflavor of your coffee. The POLY FLOW lid designed to ensure the coffee drip grind is brewed evenlyfor a better taste. They are in easy clean and dishwasher-safe plastic construction with a durablemechanical hinged lid. Moreover, they are designed for easy use, you can just fill the capsule,insert it in the brewer holder and hit brew. User Instructions: Wash Before Your First Use Open lid and fill with your favorite ground coffee. Close lid and press firmly around the lid. Insert it in the brewer and use. 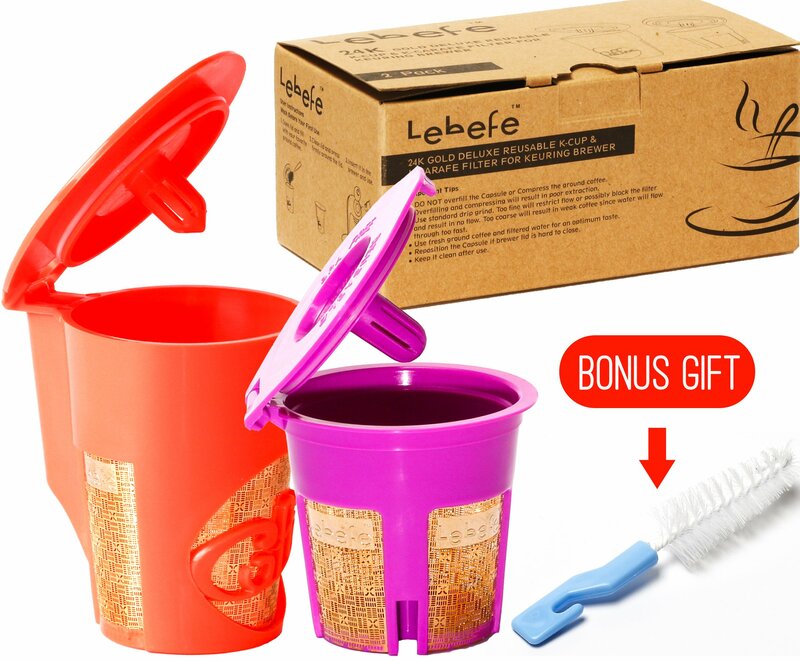 Your Pack Includes: 1 x LEBEFE 24K GOLD Reusable K-Cup for Keurig 1.0 & 2.0 Brewer. 1 x LEBEFE 24K GOLD Reusable K-Carafe for Keurig 2.0 Brewer. Bonus Includes: Cleaning Brush for K-Cup and K-Carafe. Important Tips: DO NOT overfill the Capsule or Compress the ground coffee, overfilling andcompressing will result in poor extraction. Use standard drip grind. Too fine will restrict flow or possibly block thefilter and result in no flow. Too coarse will result in weak coffee sincewater will flow through too fast. Use fresh ground coffee and filtered water for an optimum taste of coffee. Reposition the Capsule if brewer lid is hard to close. Keep it clean afteruse. For more products, please search "lebefe" on Amazon!